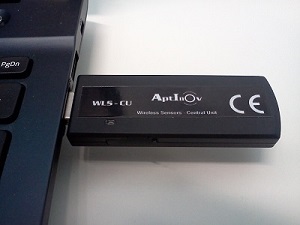 Aptinov wireless temperature and humidity sensors were designed considering the requirements for temperature control in food industry (storage and transportation) and pharmaceutical industry. Our sensors are robust and small. Furthermore, it is not necessary to be periodically recharging or replacing the batteries, unlike WiFi sensors. • Able to work in adverse environments (namely underwater). The sensors were designed taking into account the requirements of food (storage and transport) and pharmaceutical industries. Sensors have two modes of operation: Online and Datalogger. When operated in "Datalogger" mode, the sensor stores measurements in its own memory and when requested it downloads all measures to the central computer. For instance, it can be located in a refrigerated cargo box, take measurements all week long, and when the vehicle passes at reach of the central computer, a wireless connection is established, and all stored measurements are downloaded. • analyzed with your favorite spreadsheet application (such as Excel) or a simple browser. Prices are indicative and subject to discounts depending on quantities. You can call us or send us an email with your needs. We respond and make a quotation until the next business day.